"Over a year period I will attempt to lose weight to finally get down to my healthy weight (around 11 - 12 stone) which I was only 6 years ago. If you were to listen to most experts they would tell you that in order to lose weight you might want to cut down on dairy and meat... Well Im a vegan and Im knocking on 22 stone. money for vegan / animal charities." Chris will be helped by London Nutritionist, founder of Foods For Life, ION (Institute of Optimum Nutrition) tutor and co Author of "Vegan" - Yvonne Bishop-Weston. She says "Following all the publicity about the new diet pill this is perfect timing by Chris to prove the best way to loose weight is a weight loss diet based on a healthy diet"
Chris is living proof that a Vegan diet or Vegetarian diet is not always necessarily good protection against putting on weight. There are plenty of high calorie, high carbohydrate, high sugar, high fat foods and drinks that are vegan. "With help from a Personal Trainer I hope to help Chris gradually lose weight so that the fat loss is sustainable and he ends up as a shining example of how healthy you can be on a 100% plant based vegan diet." Cadburys Cows milk dairy chocolate is found to be contaminated with salmonella a popular bacteria often found in chicken, eggs and dairy products that causes serious food poisoning. Heads of Environmental Health and Directors of Trading Standards will wish to be aware that Cadbury Schweppes Plc has recalled seven different own brand chocolate products due to possible contamination with Salmonella Montevideo. Cadbury Schweppes Plc has undertaken a full product recall and will be issuing a press notice on 23 June to alert consumers to the reasons for the recall and the actions they can take if they have purchased the affected products. Action to be taken by local authorities: products do not comply with the food safety requirements due to possible contamination with Salmonella Montevideo. London Nutritionist and founder of Foods For Life Yvonne Bishop-Weston says that "Apart from the issues of toxity in fish from dioxins, PCB's, xeno-oestrogens and heavy metals there are simply not enough fish in the sea for this type of mass dosing of omega 3 DHA and EPA from fish." British artist Damian Hirst famously pickled whole animals. Now, a Portuguese vegan artist from Glasgow School of Fine Art has arranged an installation that will encourage members of the public to eat a whole cow. But is it art? Glasgow, UK (PRWEB) June 18, 2006 -- 25 year old artist Zoe Birrell’s work is featured as part of Glasgow School of Arts’ Degree Show -- An annual exhibition of final year work from Fine Art, Architecture and Design. The Times Newspaper and the Independent Newspaper have both chosen Glasgow School of Arts’ Degree show as the best Art show to visit in Scotland. The Times said: "This is the best opportunity to discover artists before their reputations and prices soar the Independent described the event as ‘one of the 'best degree shows' outside of London." Vegetarian since the age of 14 and a Vegan for the last 5 years Zoe decided to explore the issues of intensively farmed animals related to her own femininity. The life of the modern dairy cow, kept perpetually pregnant and thus full of hormones whilst suffering the emotional stress of loss of her baby calf inspired Zoe to focus on these psychological and physiological issues and the ethical alternatives. Zoe has cast her own body weight of delicious dairy free vegan chocolate, donated by Plamil Foods, into a herd of 420 chocolate cows, 300 of which the public will be invited to purchase and eat. Over the next few months there will be Vegan Festivals in Bristol, Gloucester, and London but the Vegan event liable to make the biggest impact on the thriving increased rate of world veganism is The 10th International Vegan Festival in Denmark. Despite publicity about toxity in fish, and unsustainability of fish stocks, fish oils are increasingly being added to dairy products to increase levels of omega 3 essential fatty acids. This could be The Vegetarian Society's worst nightmare as milk, cheese, yoghurts and margarine are no longer acceptable for a vegetarian diet. However a new vegetarian EPA Omega 3 product could save their veggie bacon. A Report from Flora margarine says that 80% of consumers are concerned that they are not getting enough Omega 3. Even the BMJ admit there are not enough fish in the sea to cope with present demand. Algae based Vegetarian DHA EPA seems the logical answer. 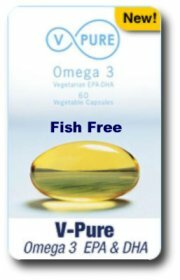 See V-Pure from Water 4 Life for more info.